Our new long-period W/SW groundswell kicked later Monday and held into Tuesday with inconsistent but strong and powerful 3ft sets on the Surf Coast, with 4-5ft+ waves on the Mornington Peninsula, shrouded by fog most of the morning (explained here) under light variable winds. The swell has eased off a little into this morning with a light to moderate onshore breeze, though workable waves across all locations for keen surfers. Wave heights should steady through the day with a reinforcing mid-period W/SW swell but conditions will deteriorate with afternoon sea breezes. Our small mid-period W/SW swell for later this afternoon should hold into tomorrow with inconsistent 2ft sets on the Surf Coast swell magnets, and 3ft to possibly 4ft sets on the Mornington Peninsula. This was generated by a weak front passing under WA earlier this week. Winds will be funky and not good at dawn, with a S/SE breeze, but we're expected to see winds tend N/NE mid-morning and likely more N'ly into the early afternoon ahead of S/SW sea breezes. Therefore don't aim for the early and try and surf from mid-late morning. Friday will be clean again with variable winds before tending more N'ly through the morning ahead of a SW change early afternoon, strengthening into the afternoon. Size wise there won't be much left with a fading 1-1.5ft waves expected on the Surf Coast and 2ft to maybe 3ft sets to the east. The change on Friday afternoon will be linked to a weak front clipping the state and a very weak windswell will likely be seen on Saturday, but again tiny on the Surf Coast and onshore and small on the Mornington Peninsula. The swell will ease into Sunday and while the Surf Coast may see an early W/NW breeze, there'll be no size, and the Mornington Peninsula will be small and bumpy. We've got better surf prospects into next week, with a long-range and inconsistent W/SW groundswell due to fill in with more favourable winds. This swell will be initially generated by a tight and strong low forming north of the Heard Island region, producing a small fetch of severe-gale to storm-force W'ly winds. The storm will track east-southeast and move fairly quickly, broadening a little and generating a fetch of gale to severe-gale W'ly winds in our western swell window, south-west of WA before weakening south-west of us on Saturday. A mix of mid-period and long-period W/SW groundswell will build through Monday, reaching an inconsistent 3ft+ on the Surf Coast and 4-5ft+ on the Mornington Peninsula into the afternoon though with light to moderate S/SE winds. The swell is due to ease slowly through Tuesday as winds swing around to the E/NE, favouring the beaches east of Melbourne ahead of afternoon sea breezes. A strong high looks to bring average S/SE winds as the swell continues to fade Wednesday, so try and aim for a paddle Tuesday next week. 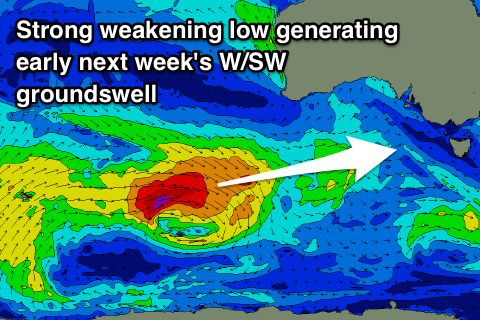 Longer term we may see some new long-period SW groundswell arriving the following weekend, but more on this Friday. Haha, quick on the update there GH! Not from your good self Craig. I meant from Huey. As always pretty lean on the surfcoast this time of year. Especially for those who can’t surf in the mornings. Daylight hours are getting shorter however. Nick, do you think the last few east coast seasons have been worse than others? The days of a few days a week having good winds and a mid-sized swell seem to be a distant memory. Basically what I said above. Last few years it seems like the coast just can't string anything together, you get a day. I.E you couldn't have a surf on a bank and then go back for another the next due too the conditions and/or sand moving. I stick too one end more than the other though which could play a part. Even with good conditions the banks have been lousy. I would say the worst Winter we've had just pass. The periods of a couple of days in a row of clean winds and decent swell seem too be getting few and far between. Stronger high pressure systems getting stuck in the bight for longer during summer? Can't be complaining too much this summer. Camped down great ocean rd for a few weeks and there was a little wave to be had every day on the low tide at a well known point. There was also a couple of good swells thrown in that fired up plenty of other spots. Nothing epic but compared to last year i reckon there was only a few surfable days for the couple of weeks over Xmas. Relentless Nor/easters here on the Mid/nth/coast over the last month to 6 weeks. There has been the odd window of opportunity if you were lucky enough to be on it @ the right tide etc! Haven't seen a swell period above 10 sec for 2 mnths! More excitement swimming with the Bull sharks in the lake!